TONALA, Mexico — The face of migration from Central America and Mexico to the United States appears to be changing. Immigration arrest statistics from Mexico for the first six months of 2016 mirror a rise in detentions in the same timeframe by U.S. border agents of Africans and Asians trying to illegally enter the United States from Mexico along the southwest border. Citizens of nations such as China, India and Bangladesh, Ethiopia, Eritrea and Somalia in the Horn of Africa are increasingly a part the migrant mosaic moving through Central America and Mexico. The increase is sharp between the summer of 2014, when the arrival of unaccompanied Central American children became a political liability for the Obama administration, and 2016. Following the migrant crisis of 2014, Mexico initiated its Programa Frontera Sur, its southern border plan meant to stop migrants at the Mexico-Guatemala border. The U.S. both inspired and is involved in that plan. U.S. federal agents are working with Mexican counterparts on Mexico’s southern border on intelligence-gathering, training and delpoyment of equipment such as mobile checkpoints. “I’m from Congo,” said 31-year-old Eric Bekabula in French, the common language in his nation. He appeared gaunt, his sneakers missing laces and fatigued in the extreme. I couldn’t verify his story, but he said he’d been studying to be a nurse when he left Congo. “We’re fine here,” he said in Tonalá of himself and his brother. He showed me a Mexican visa that allows him to stay temporarily. Tonalá is a town located in Mexico’s sweltering southern Pacific coastal region. He said he flew to Panama from Congo via Paris and then met human smugglers in Panama City. He said he and his brother then traveled by bus to Nicaragua. “We paid a guide one thousand dollars (in Nicaragua). We walked five days through the forest, no food, nothing to drink,” he continued. Mexico’s immigration agency, INAMI, reports close to eight thousand African and Asian migrants were arrested trying to enter Mexico in the first six months of this year. That was up from slightly above 4200 in all of 2015, and just above 1800 in 2014. Data from U.S. Customs and Border Protection show a similar trend. In the first six months of this year, more than 6000 Africans and Asians have been intercepted by U.S. agents on the southwest border. In all of 2015, that number was just over 5600. Other than furnish statistics, neither agency would comment on the rise. Shawn Moran, VP of the national union that represents border patrol agents, listed Somalia, Ethiopia and Bangladesh among the nations whose citizens have been detained attempting to enter the U.S. in increasing numbers in the last 24 months. Moran said it’s often next-to-impossible to establish identities of people from some of these countries. “Groups that we don’t normally see and nationalities that we don’t normally encounter, these numbers are up significantly,” he said. Moran added that agents keep hearing variations on the same story, sometimes to the last detail, implying migrants may be being coached by human smugglers. “The way people are traveling, the routes of travel are very similar, so we believe that the smuggling organizations, they have their act together. They are operating a business and right now for them, business is good,” he continued. Alan Bersin, Assistant Secretary for International Affairs at the Dept of Homeland Security, has acknowledged that migrants may indeed be fleeing for legitimate reasons. 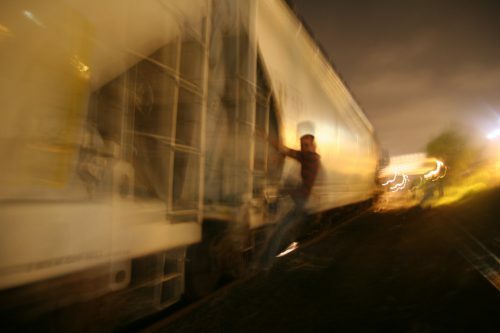 However, in written comments sent to the U.S. House Committee on Foreign Affairs, he warned migrants from far afield may include people who are “affiliated with foreign terrorist organizations, intelligence agencies, and organized criminal syndicates,” referring to migrants using meandering, non-traditional routes to try and enter the U.S. from Central America. This entry was posted in KRTS News and tagged Border Issues, Border Security, Central America, Central American Migrants, Immigration, Mexico, migration. Bookmark the permalink.